A recent Marie Kondo-inspired purge of my closet revealed the awful truth that I hadn't wanted to admit to myself: I own a lot of clothes that do not fit me. These ill-fitting clothes found their way into my closet and dresser through a variety of paths. There are the wishful thinking clothes that I'm sure I'll be able to fit back into once I get down to my pre-pregnancy weight (even though the "babies" are currently five and two years old). There are the gifts I received that never quite fit, but I felt guilty disposing of. And then there are the "insurance" clothes that are too big but I hold onto just in case. If you have a vast collection of concert, vacation, or superhero T-shirts, making a T-shirt quilt can be a great way to keep the shirts you no longer wear but can't bear to part with. Creating the quilt top is simple. Determine the size you want each T-shirt square to be, and cut out a cardboard template in the correct size. Once you have a pile of T-shirt squares, lay them out to figure out what order you want them in, and start sewing them together. If you have access to a sewing machine and can sew a straight line, you will have no trouble putting together the quilt top. You can finish the edges as is (turn under the edges of the quilt and sew them to prevent fraying), or you can add batting and backing to make it a true "quilt." If all of this sounds like too much DIY sewing to you, there are several inexpensive T-shirt quilt companies that will take your ill-fitting shirts and make you a beautiful quilt for a reasonable price. Braided rugs used to be an old-fashioned way of adding decoration to a home without spending any money. They are still a fun way to repurpose old clothes into something new and beautiful. For this craft, you will need a variety of jersey cotton shirts or tanks and scissors. You'll cut the clothes into 1.5 inch-long strips along the width of the shirt, making sure to cut one end so you have a pile of strips rather than loops of fabric. Start with three strips, tie a knot, and begin braiding the strips together. Once you have braided about four inches, start coiling the braid into a circle, and loop the closest strand through the already-braided section. This is what will keep your braided rug together. You continue braiding (adding new strands using the no-sew method outlined here) until the rug is as big as you'd like it. You can finish your rug with iron-on fusible interfacing, polycrylic spray, or spray-on starch. Using a T-shirt as a pillowcase is an old trick I learned back when I was in college with a long-distance boyfriend, but it's still a great way to reuse an old T-shirt. You could do what I did as a lovesick young freshman and just throw your pillow in the tee as is — or you could actually cut off the sleeves and sew them and the collar closed in order to make a more traditional looking pillow case. You can also take the T-shirt pillow idea one step further and make a pillow from the old shirt. Cut off the sleeves, fill the tee with pillow stuffing and sew up the bottom, collar, and sleeves for an instant pillow. Tank tops are already shopping-bag shaped — they just need to have the bottom sewn shut. It's a reusable shopping tote that looks far more stylish than any shopping bag you can buy. It is a truth universally acknowledged that your favorite pair of jeans will eventually wear out and holes will form. That's when you whip out the jeans that don't fit and cannibalize some denim as a patch for your favorite pair. Patching denim might be beyond the skill set of the average DIY crafter — as denim is thick and tough to work with. However, hiring a tailor to patch your favorites should not be expensive, and it will keep your jeans looking great. Old wool sweaters are the perfect material for creating a new pair of mittens. The simple method for making repurposed mittens is to widely trace your hands on the bottom of the sweater so that your wrists hang off the bottom edge of the original shirt. When you cut out the traced shapes, you will have four mitten shaped pieces which you'll sew together to make a pair. If you'd like your repurposed mittens to be a little heartier (with a little more range of thumb movement), this tutorial will show you how to make fleece-lined, cuffed, and perfectly shaped mittens out of some old sweaters. Fabric-covered corkboards are all the rage, but you don't need to buy one pre-made. With some cork squares, an old item of clothing with a fun pattern, and a hot-glue gun, you can create one of your own on the cheap. All you need to do is trace the cork square on your fabric, leaving about an inch of room all the way around. Once you've cut your fabric, you'll spread a strip of hot glue all along the edge of the cork and start pulling up the fabric and pushing it into the glue until it sets. Attach your beautiful new corkboard to your wall, and enjoy the envy of all your office mates. 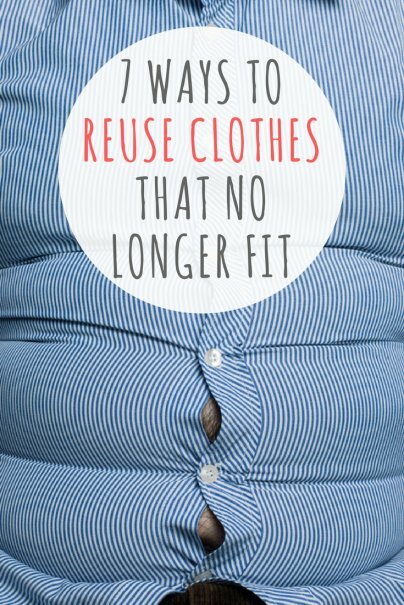 How do you salvage clothes that no longer fit? Share with us! Toss in the trash and not having to worry about wasting paper towels.